Amazon.com description: Product Description: From award-winning columnist and journalist Gillian Tett comes a brilliant examination of how our tendency to create functional departmentsÃ¢ÂÂsilosÃ¢ÂÂhinders our workÃ¢ÂÂ¦and how some people and organizations can break those silos down to unleash innovation. One of the characteristics of industrial age enterprises is that they are organized around functional departments. This organizational structure results in both limited information and restricted thinking. The Silo Effect asks these basic questions: why do humans working in modern institutions collectively act in ways that sometimes seem stupid? Why do normally clever people fail to see risks and opportunities that later seem blindingly obvious? Why, as psychologist Daniel Kahneman put it, are we sometimes so Ã¢ÂÂblind to our own blindnessÃ¢ÂÂ? Gillian Tett, journalist and senior editor for the Financial Times, answers these questions by plumbing her background as an anthropologist and her experience reporting on the financial crisis in 2008. In The Silo Effect, she shares eight different tales of the silo syndrome, spanning BloombergÃ¢ÂÂs City Hall in New York, the Bank of England in London, Cleveland Clinic hospital in Ohio, UBS bank in Switzerland, Facebook in San Francisco, Sony in Tokyo, the BlueMountain hedge fund, and the Chicago police. Some of these narratives illustrate how foolishly people can behave when they are mastered by silos. Others, however, show how institutions and individuals can master their silos instead. These are stories of failure and success. 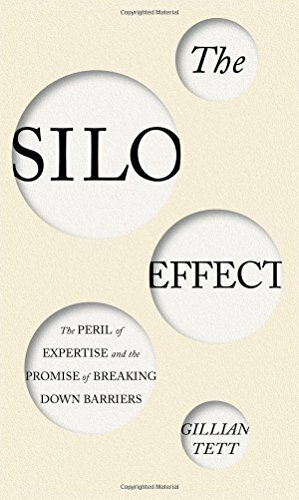 About: From award-winning columnist and journalist Gillian Tett comes a brilliant examination of how our tendency to create functional departmentsâsilosâhinders our workâ¦and how some people and organizations can break those silos down to unleash innovation. About: Award-winning journalist Gillian Tett “applies her anthropologist’s lens to the problem of why so many organizations still suffer from a failure to communicate.